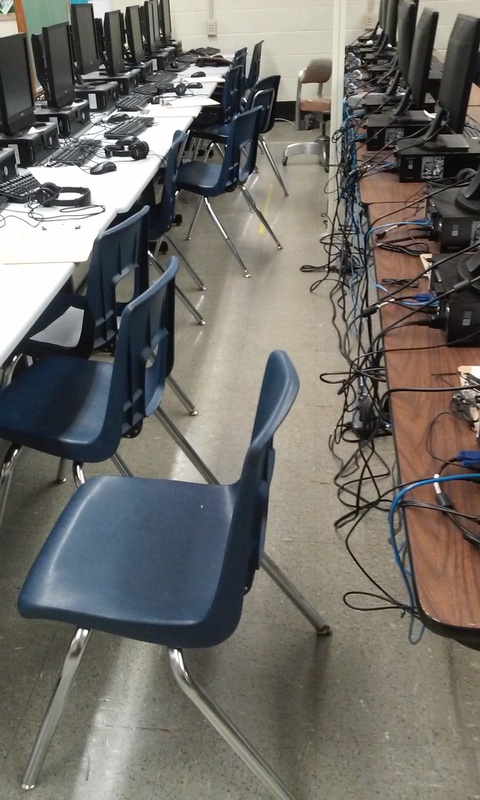 This middle school has enough computers to divide the eighth grade into two testing groups. Half will take the test in the morning, while the other half wait in their assigned proctors’ classrooms. After lunch, they switch: The morning group waits in their assigned proctors’ classrooms while the other group takes the test. They go to their regular classes at 2:00, after everyone has finished taking the test. 8:30 – Teachers’ contractual day begins with planning: make testing seating chart, write students’ names on sticky notes to label computers, pick up testing materials from Testing Coordinator, begin creating quiz for later this week. 9:20 – Homeroom announcements begin. Take attendance. 9:30 – Take students to the restroom. 9:45 – Students move to testing locations. 9:50 – Start computers; seat students; collect cell phones; distribute scrap paper, clipboards, and pencils. 10:00 – Begin to read directions; pass out student testing tickets; students start logging in. 10:05 – Technical problems begin (computer is missing a mouse, computer isn’t connected to internet, computer needs Java updates). 10:20 – Testing begins to run smoothly with only occasional technical problems. 10:50 – Students take a stand/stretch break; distribute life savers. 11:20 – Test is completed; collect scrap paper, clipboards, and pencils; return cell phones. 11:30 – Students return to proctor’s classroom where they talk, listen to music, or play on the computer. 12:15 – Students go to lunch. Return testing materials to Testing Coordinator. Eat lunch. 12:50 – Pick students up from lunch. 12:55 – Students return to proctor’s classroom where they talk while completing basic math puzzles, reading packets, social studies readings, and/or Sudoku puzzles while the rest of the eighth grade finishes testing. 2:00 – Students move to 4th mod. Many teachers are showing movies or doing other busy-work. 2:35 – Students move to 5th mod. This is the students’ elective class so most classes proceed as normal. 3:45 – Afternoon announcements begin. 3:50 – Students are dismissed. 4:00 – Buses leave and teachers’ contractual day ends. Note the testing environment pictured in the photograph above. There are 40 students testing in one classroom at one time. If one student’s foot hits the extension cord, the entire row will go out. This has happened during testing. The cables can be dangerous and distracting. 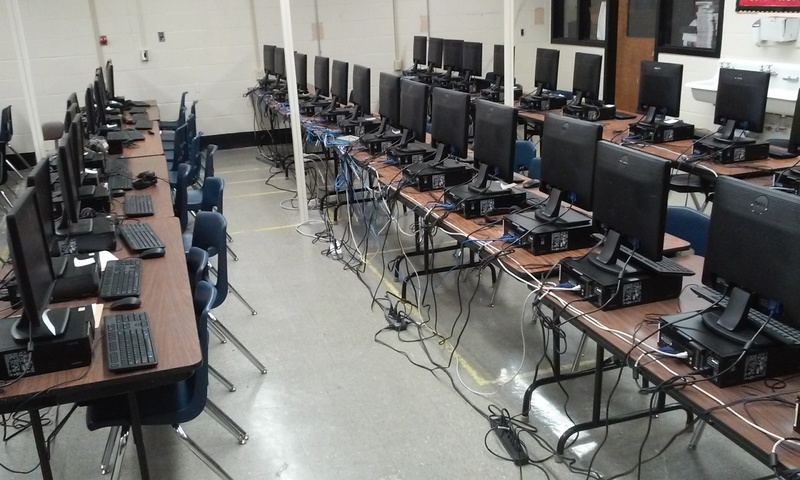 The 51 computers in this classroom were purchased solely for PARCC testing. They are set up in the ELL teacher’s classroom; consequently, the teacher and his students are displaced for the duration of testing. I totally agree. PARCC is a particularly bad test, amidst a flood of too many standardized tests. The unthinking embrace of so much testing is wasting our kids’ time and impoverishing their education.